Silent Angels and ALB are teaming up to help a man robbed by MS of his freedom and his savings. Marty is 55 years old and was diagnosed in 2002 with Primary Progressive Multiple Sclerosis and is in a wheel chair fulltime. Their need is for a “new to them” van and modifications to accommodate his disability. At the time of his diagnosis, he worked as a 2nd Shift Supervisor at a steel processing center and amazingly this family owned business adapted the plant in order for him to continue to work. However, when the business was sold six years later in July 2008, he was let go by the new owner that September. Marty applied for Social Security Disability Income. He secured COBRA health care coverage for six months. Due to a missed cut-off date to apply for Medicare, he was without health insurance for one year. The Constantine’s paid for his health care costs out of pocket for an entire year. 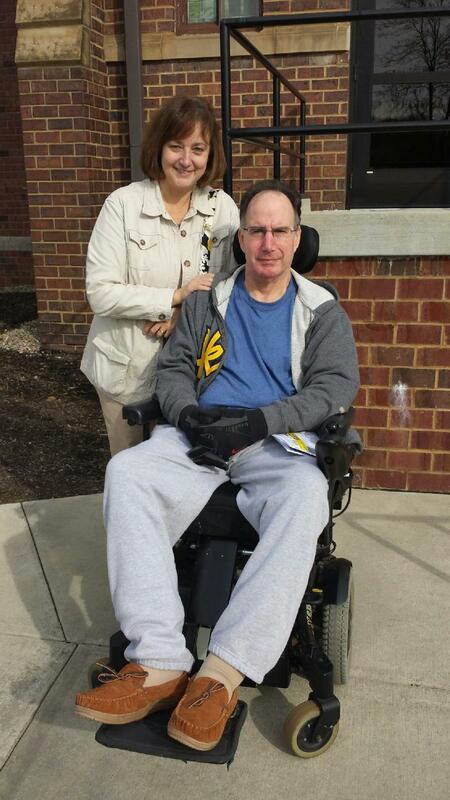 Marty also did not receive his first Social Security Disability Income check until April 2009. Needless to say, they used all of their savings and retirement during this time period to try to stay afloat financially and handle the day-to-day challenges Marty was facing with his MS. Unfortunately, they had to sell their house on a short sale. One glimmer of hope came along when a family took a chance on them and was willing to sell their mother’s condominium to them on land contract. They were able to secure a loan this past year and are no longer under land contract. Jodi works a full time job as a Customer Service Representative and does cleaning jobs on the side. Their son David lives at home and is a car salesman. Their daughter Patty is a full time student at Akron University in her 1st semester majoring in Pre-Physical Therapy. She also lives at home. Her tuition is being paid half from scholarships she has received and the other half through student loans she has taken out. Marty also has two adult sons, Michael and Thomas, who live in Cuyahoga Falls. All four children are involved in helping out with whatever care Marty needs assistance with, as their condominium is not fully equipped with handicap accessible features. The Constantine’s have never asked for help nor did they ask Silent Angels to write this note to you. Through friends of the Constantine’s we discovered the condition of their van. It is a 2001 Chrysler Minivan that was given to them by Oak Clinic for MS in 2009, which had 70,000 miles on it. They were very grateful. However, the van now is 13 years old with 117,000 miles and the body is rusting to where they had to put duct tape to hold one of the runners on the van after it fell off while Jodi was driving. The gas tank is rusting and can only be filled to a certain level before gas starts to pour out. The van is no longer safe to drive. The Constantine’s are in need of a “Used” minivan. Additionally, they are not able to handle the $14,000 - $19,000 modification costs needed to make it accessible for Marty. Make a donation in care of Marty.